The 10 Best Burgers in Nebraska! In the land of beef, there are endless options to enjoy a delicious hamburger across the state of Nebraska. To help you navigate through all of the fantastic burger offerings, we picked out the places serving the best, most flavorful combinations between two buns. Here are the 10 best burger joints in Nebraska. Tucked into an unassuming strip mall in Lincoln, this hole-in-the-wall burger joint keeps a steady line of customers coming through the door for its delicious burgers cooked to perfection. From classics to rotating specialty burgers, there’s something here for every burger lover. For a burger that’s larger than life, make your way to King Kong Fast Food in Omaha. Here you can order a giant double, triple, or quadruple burger and watch them grill it up right in front of you. Come with a big appetite and you’ll certainly leave satisfied. The name says it all. The Flippin Sweet Burger Joint in Kearney is famous for its massive burgers and fantastic freshly cut fries. Every burger is crafted by hand and comes with delicious dipping sauces that are also made in house. For good vibes and fantastic burgers, make your way to the Omaha Tap House. With 16 different burgers on the menu, there’s something for every burger lover. A local favorite is the Blueberry Hangover Burger—a patty mixed with blueberries and topped with hash browns, a fried egg, and blueberry jalapeno jam. It’s absurdly delicious. LeadBelly in Lincoln might be one of the only places you can order a burger with a cinnamon roll bun in America. The impressive burgers come with a variety of toppings and buns so visitors never run out of interesting flavor combinations to try. Saddle up! Bronco’s Burgers in Omaha is one of the state’s oldest drive-ins and burger joints. Come any time of the day and enjoy a class burger and friendly service. This is old school dining at its best. Dinker’s Bar in Omaha is a classic dive bar that serves burgers just the way they should be. 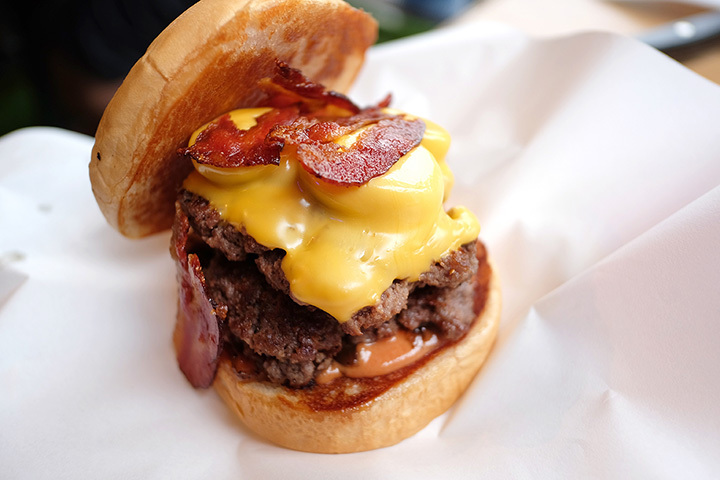 Claiming to serve the city’s best burgers for over 50 years, these burgers are greasy, stacked high with all the classic toppings, and delicious! A visit to the Coney Island Lunch Room in Grand Island is like taking a step back in time. This nostalgic diner serves delicious classic burgers, fries, and shakes at friendly prices. Don’t miss this unique, family-run joint if you’re in the area! Another fabulous burger joint in Lincoln to add to your list is the Nitro Burger stand. Located in a parking lot of a hotel near Cornhusker Highway and Superior Street in Lincoln, Nitro Burger serves up delicious beef, pork, turkey, and veggie burgers that will satisfy any craving. Every burger is made fresh right in front of you and is truly a work of art. What began as a catering service is now one of Omaha’s top spots for a delicious burger. Louie’s homemade, half-pound patties can be enjoyed with dozens of different topping combinations and your favorite cheese.